Having an understanding of the typical legal terms associated with divorce should help you navigate the divorce process with a better sense of the language. .
A Complaint is the formal legal document which is filed at the court house and begins the divorce process. The Complaint will usually state the legal foundation for the court having jurisdiction and venue over the case and petitions the court for a divorce. The party seeking the divorce will begin this process with their attorney. Being Served means the other party receives a summons with a copy of their spouse’s complaint /petition for a divorce. It is important that you go see an attorney immediately so that you can have a better understanding of your legal rights and obligations. Settlement is an alternative to pursuing litigation through a trial. A settlement agreement means that both parties were able to come to an understanding of how to resolve the divorce without having a judge hear their case. Settling out of court ends the process after the court signs off on the settlement and grants the divorce. The Discovery Process begins if the divorce is being contested or you and your spouse are unable to come to a meeting of the mind during settlement negotiations. Discovery allows both sides an opportunity to learn what the other party will say in court. It also allows both sides to have access to records such as bank statements and charge card expenses. This information allow the attorneys to better prepare for court. See below. Interrogatories are part of the discovery process and is a series of written questions drawn up by the other party and their attorney for the purpose of better understanding what the other parent may testify to in court. Depositions are often used as part of the discovery process. It is the out-of-court oral testimony of a witness that is conducted by the attorneys and reduced to writing for later use in court. It may be used to compare courtroom testimony with what was stated under oath in the deposition. An Affidavit is a written sworn statement of fact voluntarily made and under oath or affirmation administered by a person authorized to do so by law. Such statement is witnessed as to the authenticity of the affiant’s signature such as a notary public. It may be used in temporary court proceedings. Stipulation A stipulation is an agreement made between opposing parties prior to a pending hearing or trial. For example, both parties may stipulate to certain facts, and therefore not have to argue those facts in court. After the stipulation is entered into, it is presented to the judge. Parenting Plans are required when children are involved in divorce cases under the laws of some states. It typically includes a designation of custody, a residential schedule which designates where each minor child shall reside on given days. It will include summer schedules, holiday schedules, communication expectations and details about how the children will be raised. It will often allocate decision making authority to one or both of the parties regarding the children’s education, health care, extra-curricular activities, and religious upbringing. The parties may agree that either parent may make emergency decisions which are in the best interest of the child, regardless of the provisions of the parenting plan. Legal custody is typically granted to both parents no matter what form of time sharing they may have and includes access to the children’s legal records so both parents have the same legal rights. The only exception is in the case of sole custody. Legal custody also means the parents must consult with each other on all major, non-emergency matters prior to making decisions on such matters as education, medical religion and extra-curricular activities. It is common for there to be a way for the parents to prevent a stalemate such as returning to mediation or granting one parent the tie breaker on certain disputes. Physical Custody refers to where the children live on a regular basis. It may also referred to a primary custodial parent. Joint Physical Custody Joint physical custody often means a 50/50 living arrangements. Sometimes it is not exactly but it is usually something close. This only works, however, if the parents live near enough to each other that the kids can move easily back and forth between houses and can maintain their regular activities no matter which house they are in. Mediation is a form of settlement negotiation (facilitated by a neutral third party) and non-binding resolution. The mediator is a trained neutral who will help assist the parties to settle their divorce. The process is confidential and cannot be used in court. The goal is to resolve the parenting plan and financial aspects of the divorce. Mediation may be done with or without the attorneys present. Guardian ad Litem (“GAL”) is typically a trained family attorney appointed to be the eyes and ears of a judge in a divorce proceeding. Their role is to act as a neutral third party who advocates for the best interests of the children involved in the divorce. They may provide the court with a written report and/or testimony. They may provide a recommendation for custody and parenting time. Custody Evaluator is a mental health professional appointed to answer specific questions for the court such as the fitness of the parents, their ability to co-parent and shield their children from conflict. Typically they will administer testing of the parties and sometimes the children. They also investigate any parental allegations such as neglect, alcohol abuse, alienation and other concerns. A custody evaluator provides the court with a written report and/or testify in court regarding custody and time sharing. Custody evaluators may recommend custody and time sharing. Judgement is when the parties are unable to resolve their own divorce and must have a hearing before a judge. Your divorce process and final judgment is typically public record and your children may one day go and read all that was said in court. Collaborative Law Process is a legal process enabling couples to avoid the cost and damage of going to court and to achieve a settlement that best meets the specific needs of both parties and their children without the underlying threat of litigation. This voluntary process must include two collaboratively trained family attorneys and all parties must signs a contract (a participation agreement) binding each other to the process and disqualifying their respective lawyers right to represent either one in any future family-related litigation. A Divorce Decree is when the court has made a final ruling and judgment order that makes the termination of a marriage official. 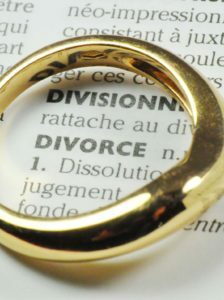 Each divorce decree will be different, but in general, the purpose of the decree is to summarize the rights and duties of each party in connection with the divorce. The divorce process is not complete until a decree is issued.